Houzz 37 of our visitors have told a friend about this plan. 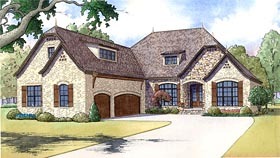 This beautiful European style design features a brick and stone exterior with arched windows and doors and a courtyard oriented 3-car garage. Once inside, the foyer welcomes you with the dining room on the left, 2 bedrooms with a Jack & Jill bath to the right, and the Great Room ahead. The Great Room features an optional vaulted ceiling and a stone fireplace and the room is open to the kitchen and has 2 sets of French doors that open to the rear grilling porch. The kitchen offers a large eat-at island bar, perfect for entertaining, and a walk-in pantry with a breakfast room next to it. Around the corner from the kitchen is the Master Suite with a vaulted ceiling while the master bath features a corner glass shower with a seat, a free-standing tub, and a huge walk-in closet. Coming in from the garage, you’ll appreciate the kid’s nook with a corner bench and hanging space that doubles for a mud room with the laundry room next to it that offers a convenient closet. Upstairs over the garage, is a huge bonus room and bathroom that presents tons of useful opportunities. Answer: On this particular plan the overall square footage doesn’t change, because we push the walls in instead of out. And we measure square footage from outside wall to outside wall. However, the inside room dimensions will be a little smaller. Question: Is this a gas fireplace? If it is can this be changed to a wood burning fireplace? Would you happen to know the cost to make this change? Answer: Yes, it is a gas fireplace, and to have it changed on the plans would be a modification request. Question: What material is this roof? Answer: Roof Roof Pitch Main: 12:12 Designed Roof Load: 45lbs Roof Type: Shingle Roof Framing Description: Stick Wall Construction: 2x4 Ridge Height: 31Ft. Question: Are there any pictures that show the rear with a walkout? Answer: No. Our walk out basement is a foundation only. So, we do not specify a specific location for doors. Since this is not shown and the space is not finished, this is not provided in an elevation as it is up to the owner to determine placement. Question: If you don't mind, please tell me the proposed materials to be used for the construction of the safe room walls. Answer: The safe room walls are 8” concrete. Question: Hi, can you send me dimensions of just the master bath without the closet? Question: What kind of cabinet space is in the kitchen? Is the back porch covered and is it concrete? Answer: 1. What kind of cabinet space is in the kitchen? answer: there is approx 12’ of upper cabinet space along the wall; with a 10’ island w seating 2. Is the back porch covered? answer: yes the rear porch is covered (note the squares on corners represent the posts) 3. is it concrete? answer: floor can be concrete if desired – strictly up to the homeowner.